Happy February! 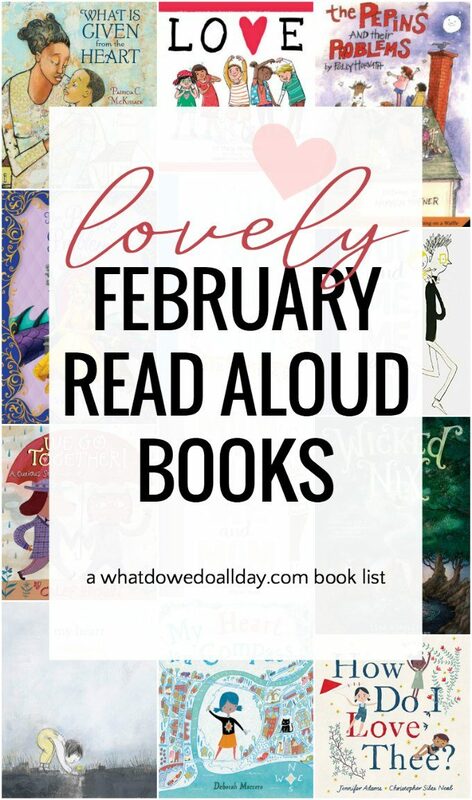 Welcome to the read aloud book list that will get you through the shortest month of the year. Unlike my January book list which had nothing to do with the month itself, these February books will remind you of the love-themed holiday of Valentine’s Day. At least the picture books will. I was a little more lax with the themes of the chapter book read alouds I chose. These February picture books are eminently suitable for the month with Valentine’s Day,. 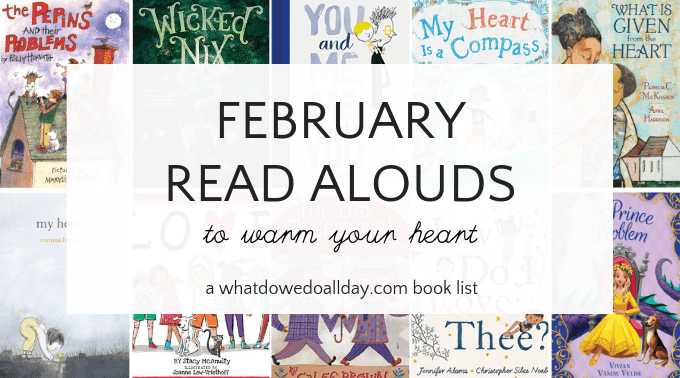 For more picture books that celebrate love and matters of the heart take a gander and my list of Valentine picture books about love and kisses. Love by Stacy McAnulty. On each page, McAnulty begins, “Love is…” Love is a gift, time spent with friends, a shared meal and so forth. The text is simple and children will easily relate to the actions that come as a result of love as shown in the sweet, colorful illustrations which depict a wonderfully diverse group of kids! After you read this book aloud to your children, help them plan ways in which they can show their loved ones how they care. What Is Given From the Heart by Patricia C. McKissack. A pastor announces to the congregation that they will be making “love boxes” for those in need, for “what is given from the heart reaches the heart.” At first, James Otis, a boy with very little himself, has trouble seeing what he can possibly give a family that lost everything in a fire. His mama turns their tablecloth into an apron and James Otis searches his heart and discovers there is always something you can give someone else. This is McKissack’s final picture book. Read it! My Heart by Corrina Luyken. Beautiful, lilting rhymes describe the myriad of ways our hearts feel and how they change. Hearts can be open or closed, they can feel bright or shadowed. Luyken’s evocative charcoal illustrations add detail and charm. This book will resonate with all children (and parents, alike). Not to be missed. My Heart Is a Compass by Deborah Marcero. Rose is looking for something unique to bring to show and tell. She doesn’t know where to look so she uses her imagination and starts to draw maps to help her search for a treasure. She draws all kinds of maps, still thinking she can’t find something to share with her friends. So she takes her maps into show and tell and they turn out to be the treasure she was looking for. I’d say this picture book, with its marvelous illustrations, is the treasure you have been looking for! Mom and Me, Me and Mom (and others) by Miguel Tanco. This trio of books (and I’m guessing a sister version is on the way) are a sweet way to celebrate the special bond kids have with siblings and parents. Spare text and simple but inviting illustrations remind us of the small joys in our relationships with family members. Love poetry is not just for romantic couples! Share these lively, heart-felt verses with your children in February and all year long. How Do I Love, Thee? by Jennifer Adams. This lovely picture book is an adaptation of Elizabeth Barrett Browning’s famous sonnet. Instead of a romantic love poem, Adams reimagines it as a poem of friendship. The illustrations show a diverse group of children playing outside. The endnotes includes the original poem and a bit about Browning. Delightful. We Go Together! : A Curious Selection of Affectionate Verse by Calef Brown. Extra cheerful word play make these short rhyming poems a delight. Great for younger kids and for sharing one on one. Wicked Nix by Lena Coakley. This short novel is suitable for reading aloud to children ages 7 and up. I thought about saving this book for one of my summer month read aloud lists but decided that the theme of finding family love was suitable for February. Nix thinks he is a wicked fairy and he is upset when a man moves into the cottage for he thinks the fairy queen will be unhappy about it. Nix plans to drive the man out with pranks and confides in his people-friend, a girl he calls Rose the Wise. But all is not as it seems and Nix learns something about his true self. I like this as a read aloud because children and parents can discuss how reliable they think Nix’s narration is, an excellent way to develop reading comprehension. The Pepins and Their Problems by Polly Horvath. I can’t believe I hadn’t discovered this gem of a book before now! Oh, how we laughed when reading it aloud. The Pepins and their very fine neighbor Mr. Bradshaw get into very peculiar scrapes while the author breaks the fourth wall, asking the reader to help solve the Pepins’ problems. The Pepins are not the sharpest tools in the shed and some of their antics reminded me of the hilarious stories of Chelm. If you want a book that will make your kids laugh, pick this one up next. Suitable for reading aloud for ages 7 and up. The Prince Problem by Vivian Vande Velde. A few years ago we discovered Velde’s book 8 Class Pets + 1 Squirrel ÷ 1 Dog = Chaos which became one of our favorite hilarious read alouds ever. I’ve put it on many book lists. The books of hers that I’ve read tend to be reliable read alouds with crazy antics, funny mishaps, unique characters and plenty of opportunity to try out silly voices. In this novel, a dreamer prince and a practical princess cross paths while he is under a very inconvenient spell and she has been kidnapped. I only wish publishers wouldn’t make these covers so gender-oriented because boys will love this story, too. Suitable for reading aloud to ages 7 and up. February is such a sweet month to remind us of love and care. These books will sure to be great reminders for us. I will read them with my son to celebrate this special month. Thank you!